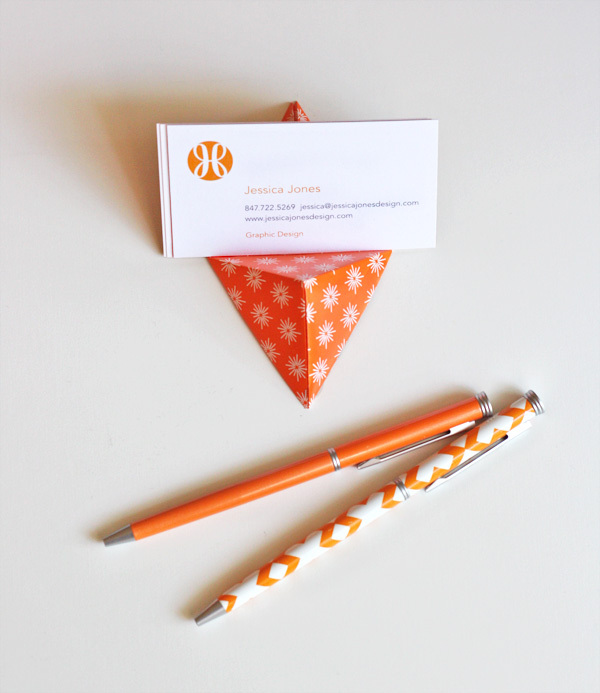 In just a couple minutes you can fold an easy double-pyramid stand for business cards or phones. Check out the video tutorial from Leyla Torres right here. Below is a still from Leyla's video. Wouldn't it be cool to fold a whole bunch of these, hot glue them to cardboard, and hang them on the wall? 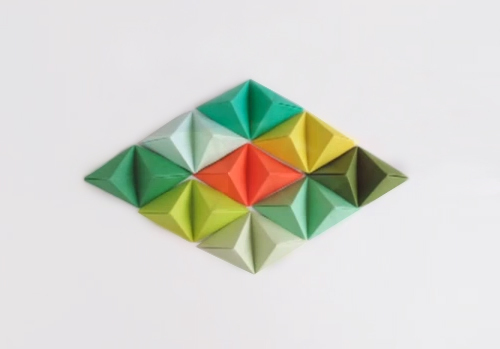 The trick would be to use gorgeous colors, so you might try this origami pack of 100 different hues. I used some on this thing. And it's just a fraction of my orange thingies. Someone was over here the other day and said, "Hmm, you have a lot of orange things. Is that on purpose?" You mean you were guested by the one person who doesn't follow your blog?! Never. But I do mow. And now I must. Byeeee! you two are so cute- communicating through the comments like that! I don't usually read them but I wanted to know where you got the orange, of course, pens that are shown in this post's top photo. I got them at Office Max a few years ago. Not sure if they still have them, though! I love this idea, and double sided card stock would make a sturdy stand! Thanks! So I have an origami group meeting at my place of work. They always leave us a little something, but maybe we should get them to leave us a few of these! Thanks for the great idea! I LOVE these. Just right for iphones. Already made a bunch of them for different rooms at home from a recycled calendar with lovely Japanese prints. Would be lovely to display business cards if you're selling at a craft show too. Jessica your posts are so awesome I find myself looking forward to them. Did I mention I love origami and never cease to be amazed at the wonderful things that can be made. Here you have brightened it up with orange with is fantastic.